I’ve thought a lot about the tag line we’re using as part of our annual fund raiser . . . Support what you love. Make time for art. While I hope you will support us financially and claim a $50,000 match, I hope even more you take to heart what I think is the essence of the idea. I don’t know about you, but I find it way too easy to get sucked into the 24 hour news cycle and the ceaseless yammering for my attention. The claim that we spend nearly eight hours a day consuming media doesn’t surprise me . . . and it’s something I think we should all find alarming. So my interest in Support what you love; Make time for art is equal parts plea, encouragement, and admonishment that we all make the effort to move attention from what is titilating, angering, exciting, and exasperating . . . basically everything that’s on offer in popular media . . . and allocate some of that life energy to a great walk, or time with an absorbing book, or writing an actual note to someone you love, or taking an art class, or really anything that helps you to live life more artfully. I believe art has much to offer us. Making art, watching art, being around art . . . it provides us the opportunity to move our attention from ourselves and our own view of the world to another view, to the views and experiences of someone else. Support what you love. Make time for Art. 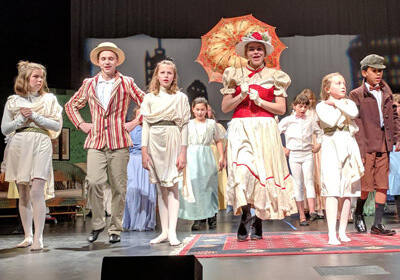 For the past couple of months, our musical theater students have been rehearsing for Mary Poppins, Jr.—which means at the Blue Heron and Kay offices we’re all singing about “jolly holidays” and “spoonfuls of sugar.” None of us sound nearly as good as the kids, of course. The kids are amazing and the show will delight you to no end. Which is what you likely expect from our wonderful directors, Marita Ericksen, Christopher Dawson and stage manager, Elise Ericksen. But let me give you just a little insight into how much work goes into these shows—and this is just the start. 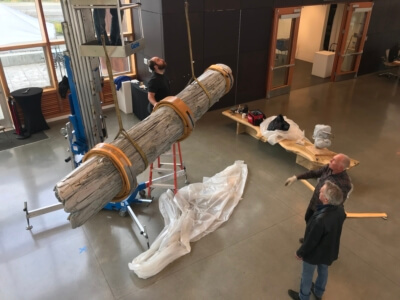 Elise, who is also the company’s costume guru, has gathered together 116 costumes for the cast—enlisting ingenious parents, the helpful generosity of Sarah Edwards at 12th Night Productions, and even our local consignment store, Rocket! Which is all well and good, but of course, there have to be costume changes, too . . . in this case, a mere 130 of them. It sounds exhausting. Which is why I’m in the audience. Cooper Tantau feels differently—for Cooper and this crew, Musical Theater is essential. 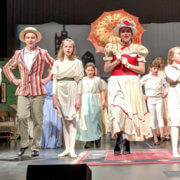 Cooper felt so strongly about joining the Mary Poppins Jr. cast, that when he and his mother undertook a move to Portland this past fall, he said, OK . . . but I have to do VCA Musical Theater. So, with a little extra help and some creative thinking, Cooper has been “skyping in” (conference call style) twice a week to be a part of rehearsals. Now, you don’t need to know any of this to appreciate a great show—and Mary Poppins Jr. is a great show. I might even say it’s supercalifragilisticexpialidocious. See? Now you’re going to walk out singing, too. I got this email the other day . . . I saw in the Beachcomber that VCA applied to Granny’s for money for a defibrillator but did not get it. Do you still need one? If so, my wife and I will fund it. I should back up. We’re super aware of three things. VCA is a designated community rally point and shelter in an emergency. We have lots of visitors on a daily, weekly, and monthly basis. From the very youngest to our most experienced. Seconds count between good and bad outcomes when it comes to a cardiac event. Add all that to the large count of people that are also within walking distance from our doors and we thought it made sense to have at least one defibrillator on our campus. It turns out our anonymous donors agree! From the subsequent communication it became clear that these folks had some professional familiarity with the equipment and we quickly settled on a plan. The check is in the mail and the gear is on order! Thank you dear donor for supporting what you love . . . in this case, another beating heart. I just want to give another shoutout to Caroline Rockey . . . I have blogged about her several times before, and there are few people who have more fun in life than Caroline. We know her best for her fabulous work with our youngest artists. We’re mailing out a card she did for our December miniature show. Thank you Caroline for your ongoing great support for what you love! Calling All Poets: Fantastic Ekphrastic Poetry! Calling all Poets! We would love to read some of your verses! As part of our wonderful Wordless Stories show in the Koch gallery, we’re calling for Ekphrastic poetry . 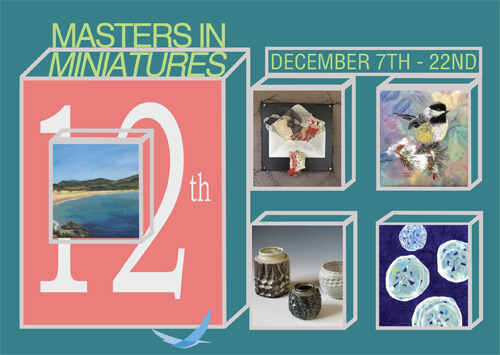 . . poetry inspired by the work you’ll find in our gallery by some truly amazing Vashon Artists! Here are some important clues. WELCOME! Take your time looking at all the art in the gallery and the foyer. Including the Popeye head on the wall behind the front desk! Settle on a work that captures your attention, and really settle in. Hang out, experience it, feel into it, let it speak, take all the time you need. Yes, you can snap a picture of it, to work from, but do take time to be with the art itself. Remember, ekphrastic poetry doesn’t talk about what the art looks like so much as what it makes you think of, feel, wonder about, imagine, conclude. Make notes, then go write your poem, no more than one page long. Email your poem(s) to BOTH calkinnear@gmail.comand lynch@goddard.eduby the end of November 19th, with EKPHRASTIC in the subject line. BE SURE TO NOTE WHICH WORK OF ART INSPIRED IT. Send it in PDF format if you can, so your fonts stay true. If you don’t know how to make a PDF, just send it as a .doc or .docx. Selected poems will be displayed by the art during Thanksgiving week, and up until the close of the exhibition November 29th. Authors of selected poems will read them at the closing reception, on November 29th, from 7-8pm. Direct any questions to Cal and/or Susan at emails above. I’ve become a big fan of The Moth Radio Hour, a twenty year journey of storytelling that now numbers in the range of 25,000 recorded stories. If you’ve never listened . . . well, let me encourage you to make time, plug in, and get swept away. Here’s the first recored story. It’s short. It had to start somewhere. One of my favorite recent stories is called Bring Me Liberty or Bring Me A Dress, a rousing and delightful story by a woman named Sue Schmidt. It’s sort of about drumming but really about saying yes to art, to being, to life. It’s just brilliant. A much more recent story by founder George Dawes Green called the Haunted Freezer is just hysterical, sweet, poignant, and a must listen. Enjoy!